If you're anything like me, you'll know how soothing and cosy the perfect seasonal candle can be for these dark and chilly evenings at the tail-end of the year. 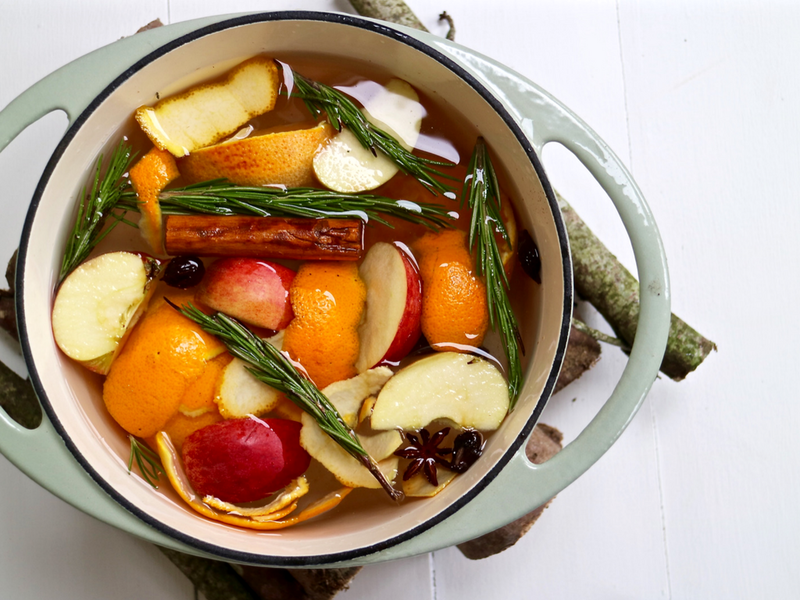 From warming and earthy to sweet and musky, that one comforting scent can completely transform a grim and dingy autumn evening into something altogether more snug and homely. 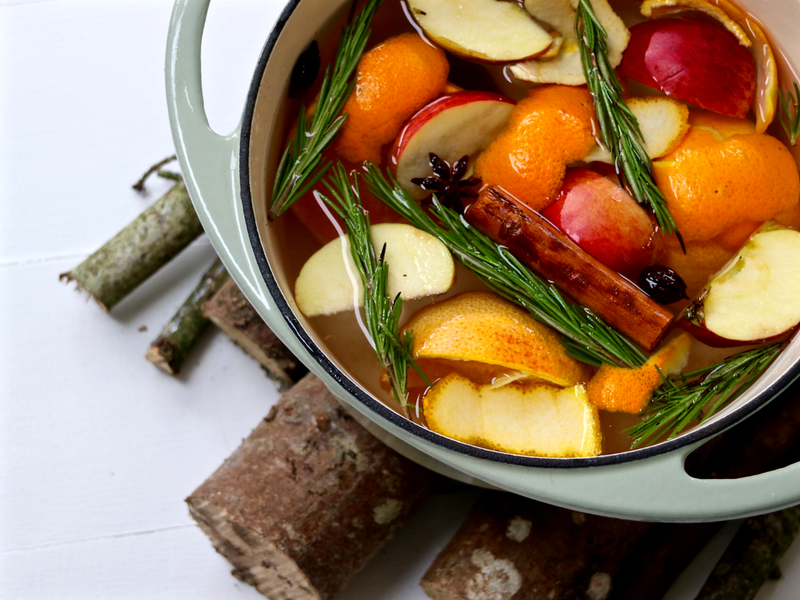 This year, however, I've decided to go one step further and take a more natural approach to filling the house with those beautiful, seasonal scents... by making up my very own autumnal simmer pot! 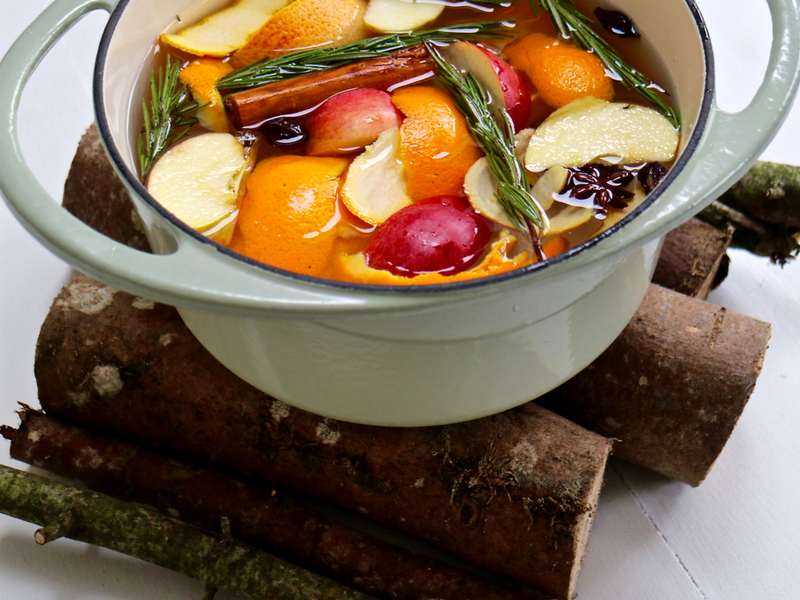 A simmer pot is a great, homemade way of mimicking the effect of those delicious seasonal candles...but, a word of warning here, you might never want to go back to candles again after trying this! NOTHING can match the natural aroma this little pot will create! 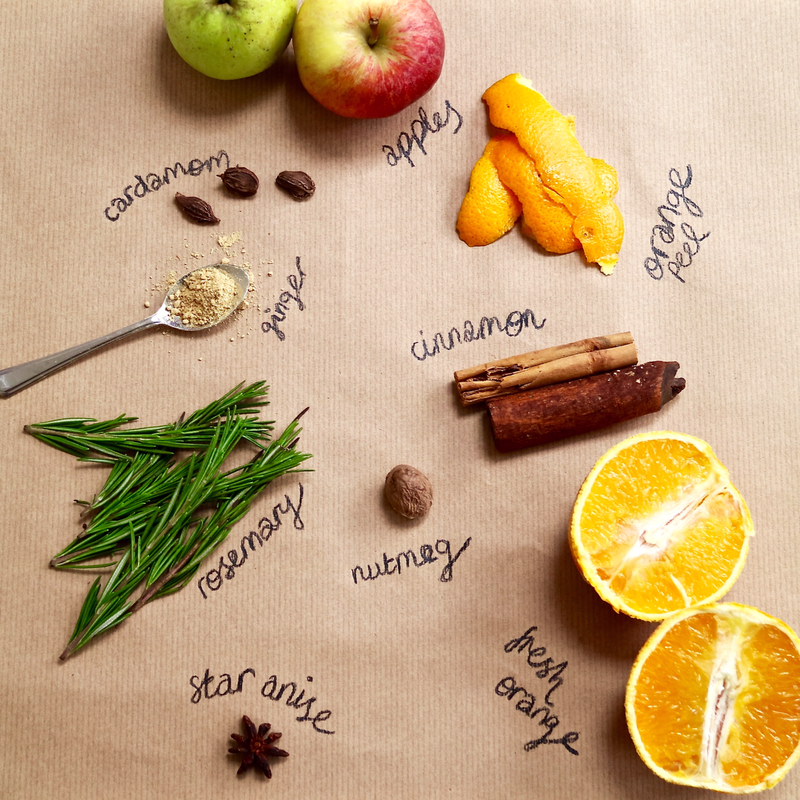 Ingredients-wise, it's a simple case of gathering together some seasonal fruit and a few herbs and spices. The things I've selected below are merely a suggestion, as they were just what I had in the cupboard at the time. If you wanted to make it even more seasonal, you could add in some pumpkin spice or even vamp it up in time for Christmas with some fresh thyme and berries- it's totally up to you! 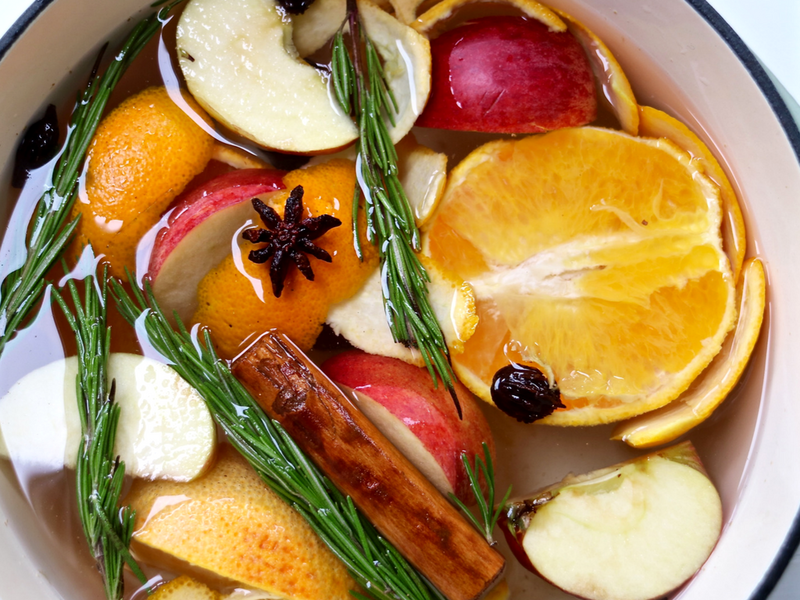 All you have to do is add these ingredients to a pan of very gently simmering water and wait for those beautiful smells to fill up your kitchen. 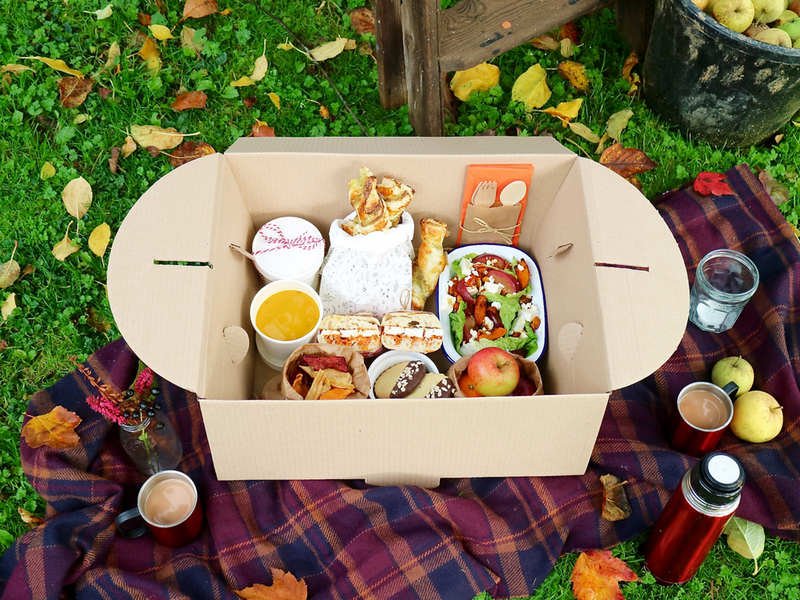 I guarantee, it really will put you in a very cosy, autumnal mood. 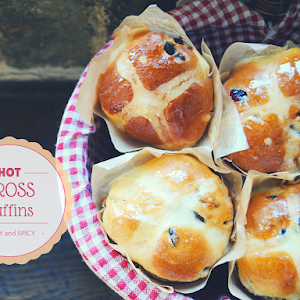 Plus, it all looks pretty enough to eat! 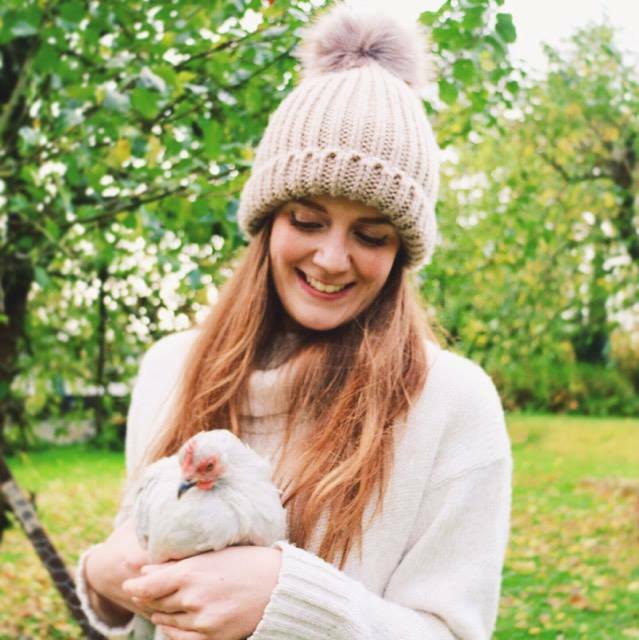 Let me know if you decide to give this one a go at all, I'd love to see a cosy-looking Instagram or two! 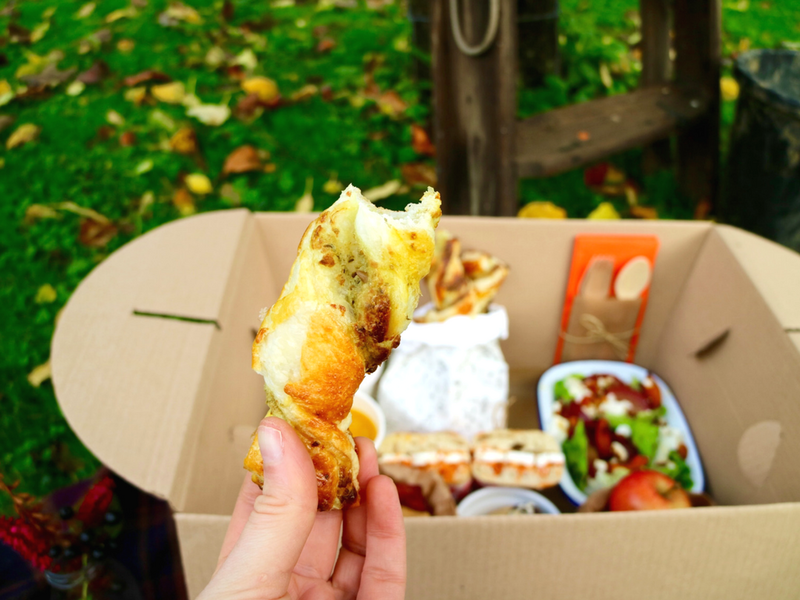 And if you're particularly interested in all things cosy, why not have a read of my previous post...A Very Cosy October Picnic. 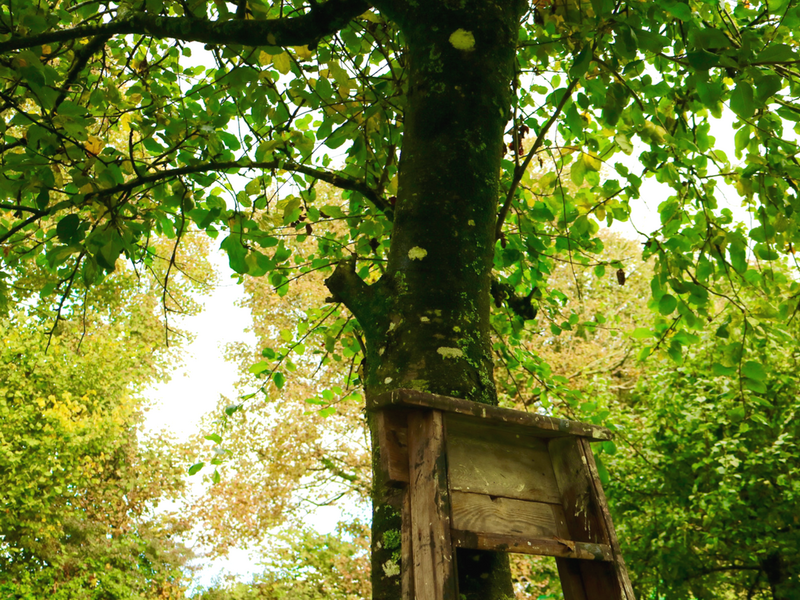 What's your favourite autumnal or winter scent? I'd love to hear all about it in the comments below! If you're a regular reader, you'll know that I'm quite obsessed with anything cosy + super-duper laidback in style. 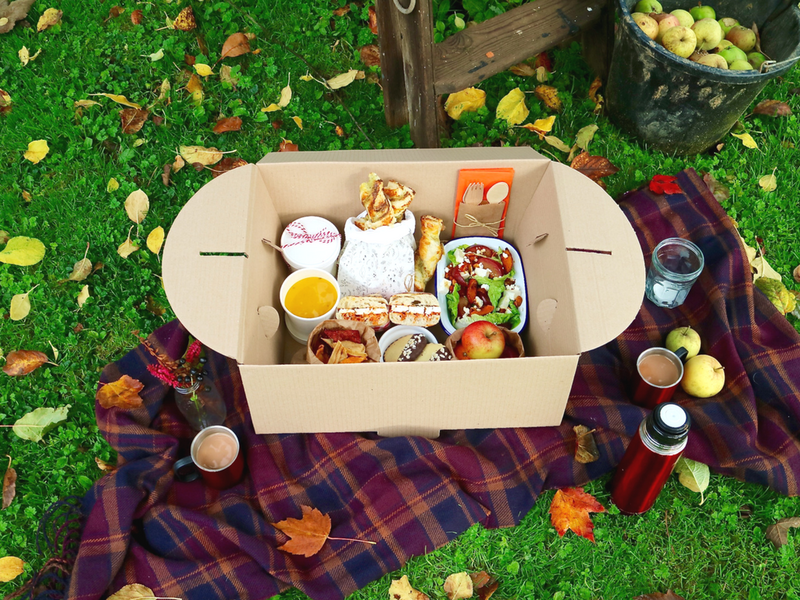 It'll therefore come as no surprise to anyone that, when I got my hands on a copy of Meik Wiking's The Little Book of Hygge, I immediately became consumed with the idea of putting together my own hygge-inspired autumnal picnic. 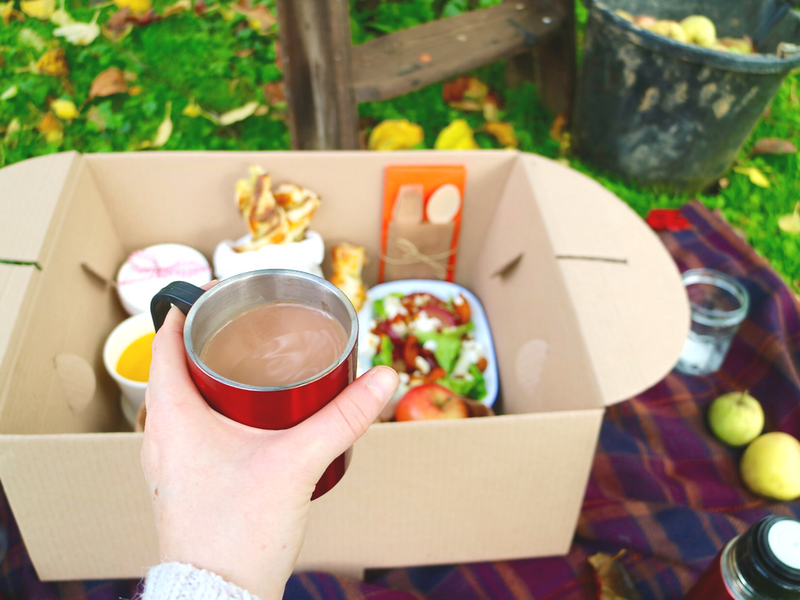 Candles, tea, warm soup and plenty of homemade snacks were all obvious ingredients for this picnic... but, because I also wanted this to be a portable and easy to put together treat, I decided that I would forego the usual hamper and pack everything into a cardboard gable box instead. 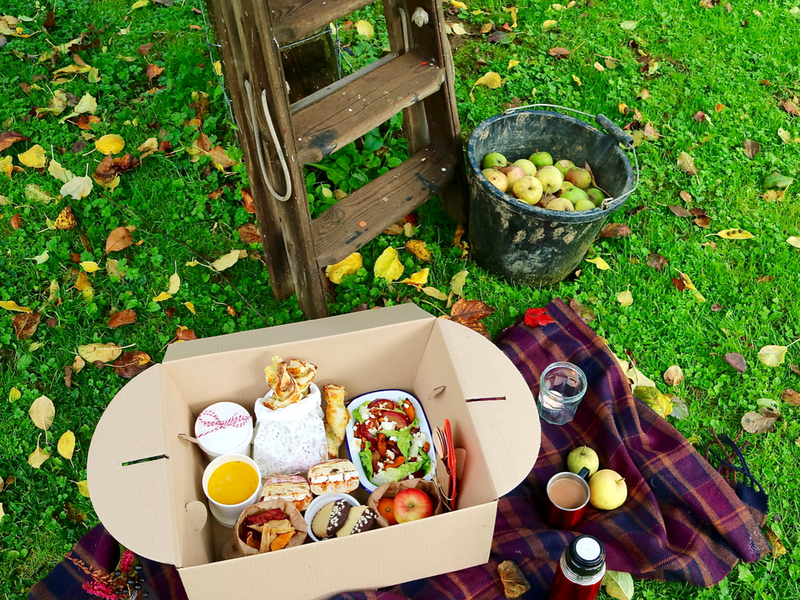 And as it was a glorious day to sit under the apple trees today, I thought I would take a few snaps of what my perfect October Picnic Box would contain and share them with you all! 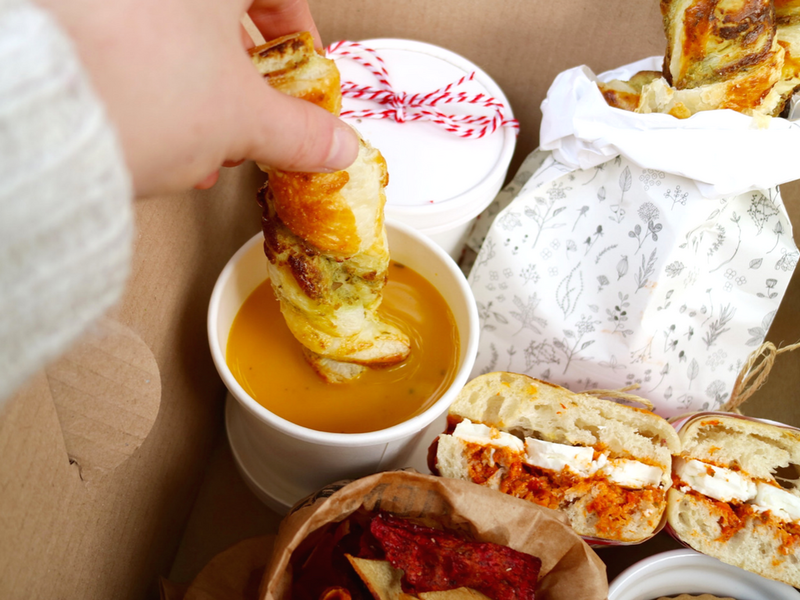 So what's inside my perfect little box for two then? 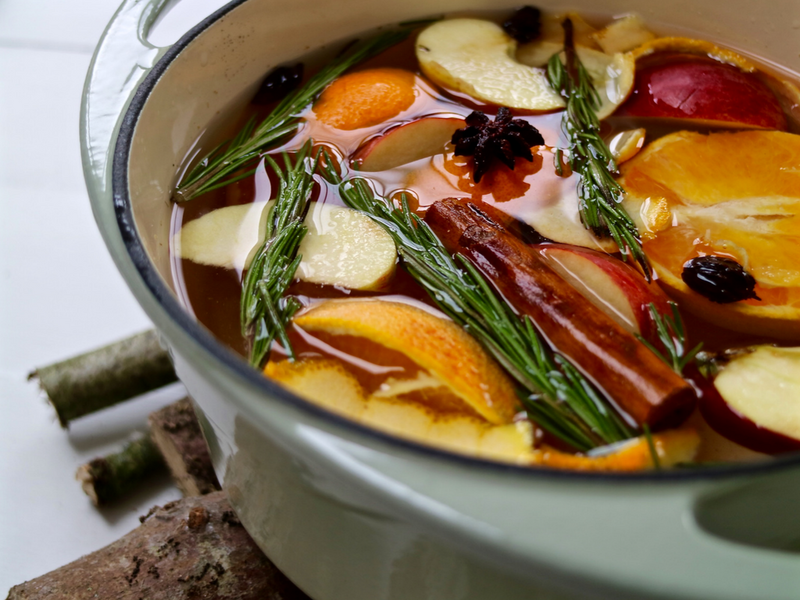 didn't want to bore you with another autumn soup recipe! 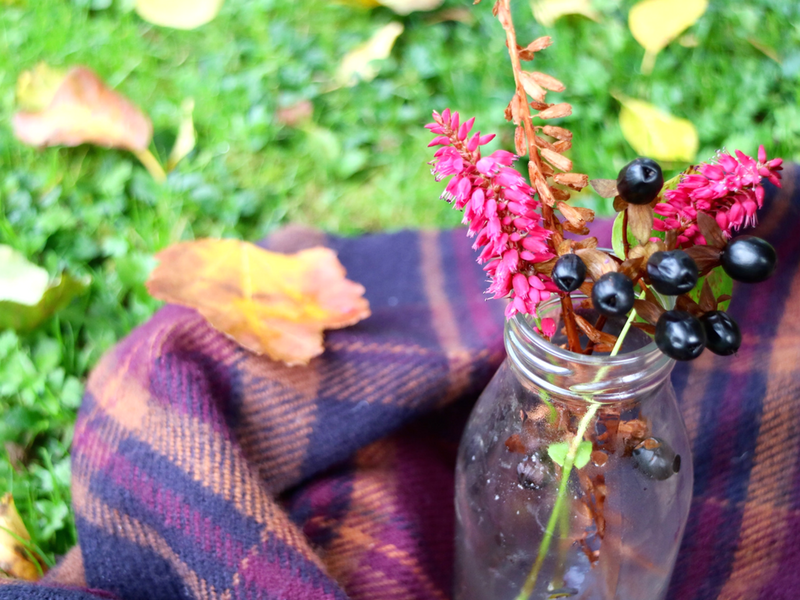 Of course, you can't have an all-out autumnal spread without a little bunch of seasonal flowers! These were just a few sprigs that I picked from the garden but I must admit, I was quite tempted by the Bloom & Wild Posy Party blooms... such a lovely idea! 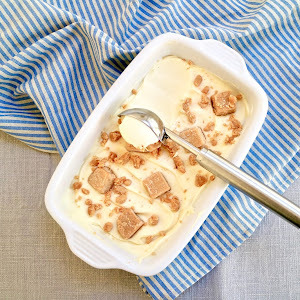 Perfect for dipping in the soup! 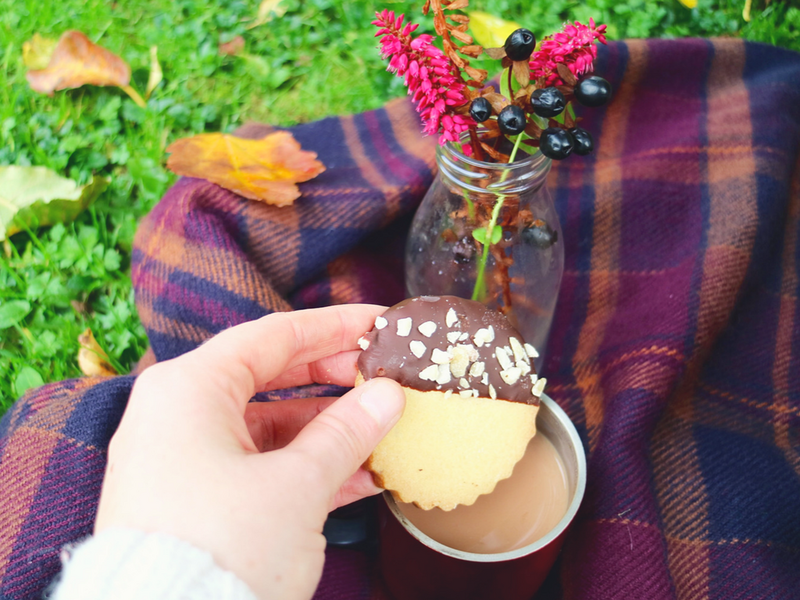 Nothing like tea + biscuits on a chilly day. 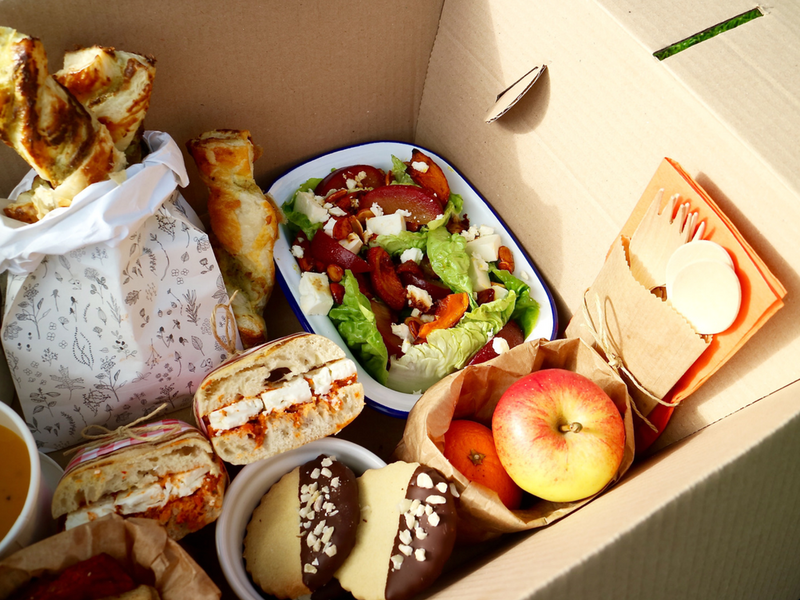 I would seriously love to take a box like this out on a day trip or a walk sometime soon; it made for such a yummy mix of treats and I think (with a bit of clingfilm and foil over those snacks!) it would be a lot easier to carry around than a hamper. I'm thinking perhaps a seaside-themed one to take down to Bude next time...what do you think? 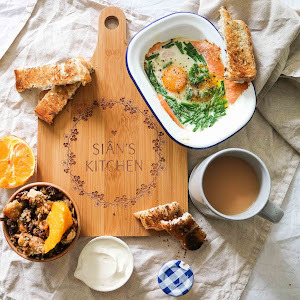 I absolutely loved gathering ideas for this hygge-inspired feast from Pinterest, so much so that I now have multiple cosy party style boards over on my page! Which one would you like to see me attempt next? I'd love to hear your thoughts in the comments below. ps. 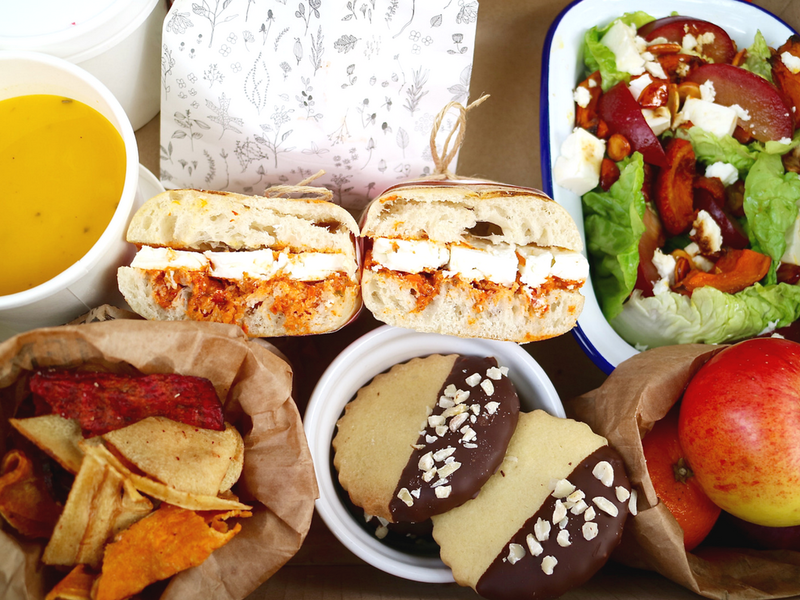 If you're interested in any of the picnic supplies featured in this post, you can find the links for them right here! I've been wanting to make a homemade wreath since I saw these beautiful, 'real leaf' examples on Pinterest last Christmas. I think there's something so special about being able to gather the materials for your wreath yourself! 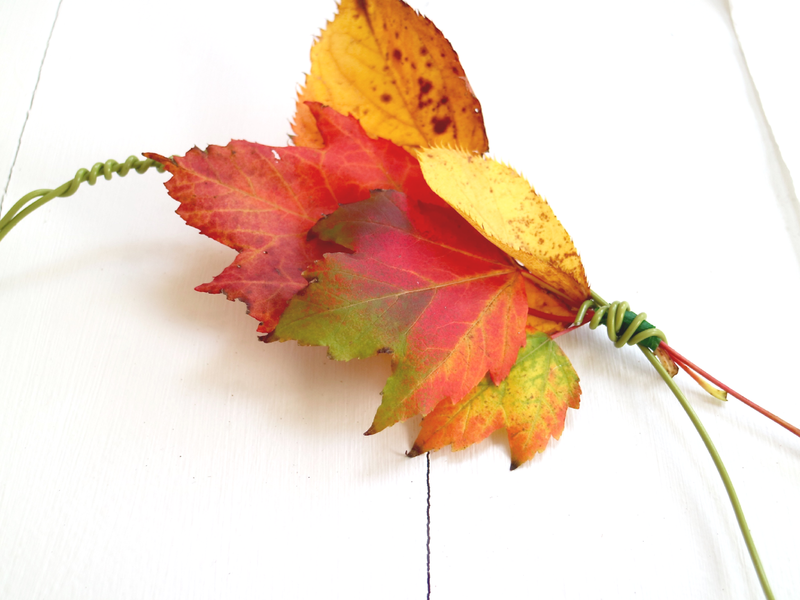 So, of course, when I saw that the trees in our garden were starting to shed their gorgeous red and yellow leaves, I had to come up with an autumnal version of those perfect Christmas garlands to share with you all. 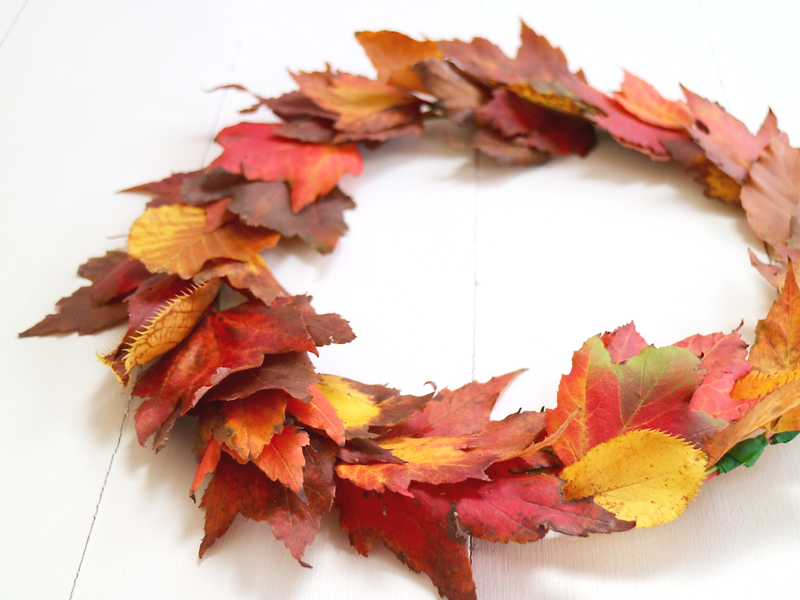 The technique in making this wreath is really quite simple, all you need is a little bit of time and patience, a few basic materials and some super dextrous fingers! Don't be put off by the thought of this being a tiny bit fiddly, however- if clumsy old me can manage this craft without having a complete breakdown, anyone can! 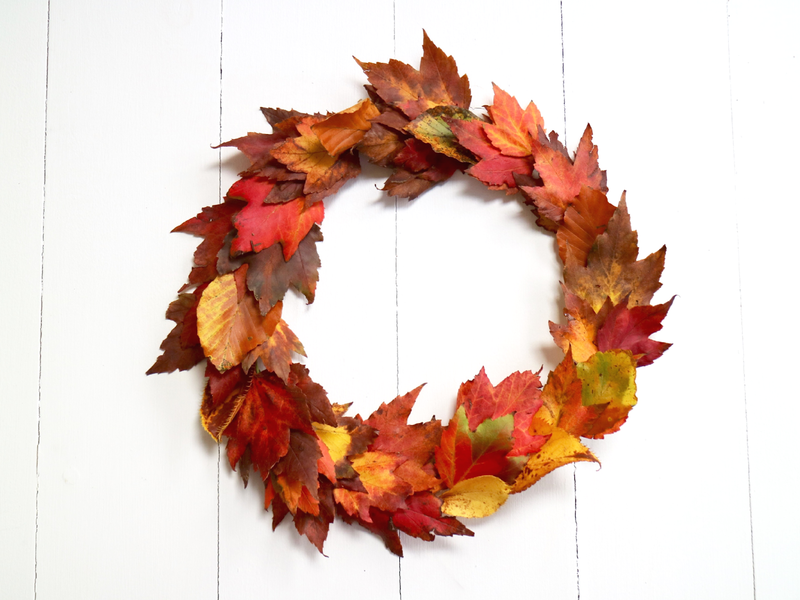 Of course, you don't have to use real leaves for this wreath if you can't gather enough to go round. You could use paper cut-out leaves (like this, so cute!) some felt flora or even fake plastic ones instead, it's completely up to you! 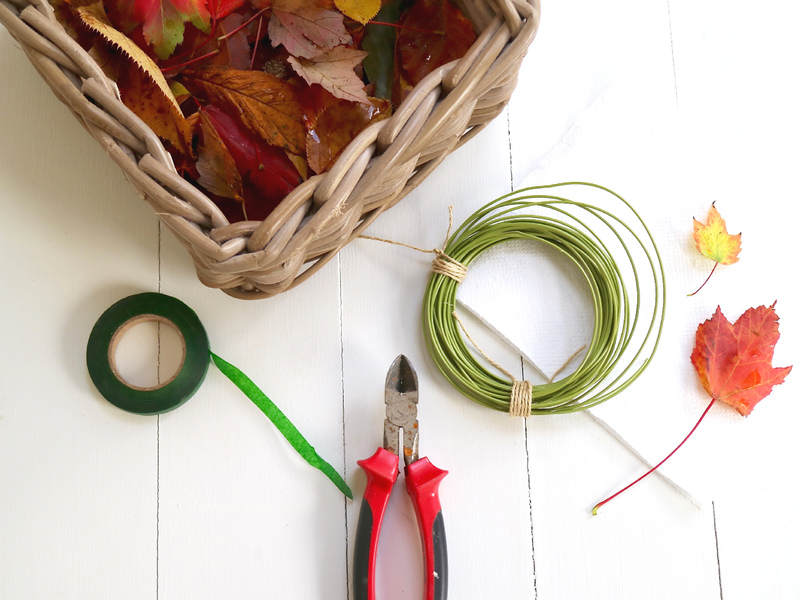 Real or fake leaves aside, the first thing you'll need to do is to make the shape of your wreath from garden wire. I kept mine pretty twee in order to fit onto our door hook but however big or small you decide to go, always be sure to leave some excess wire to wrap your circle together. 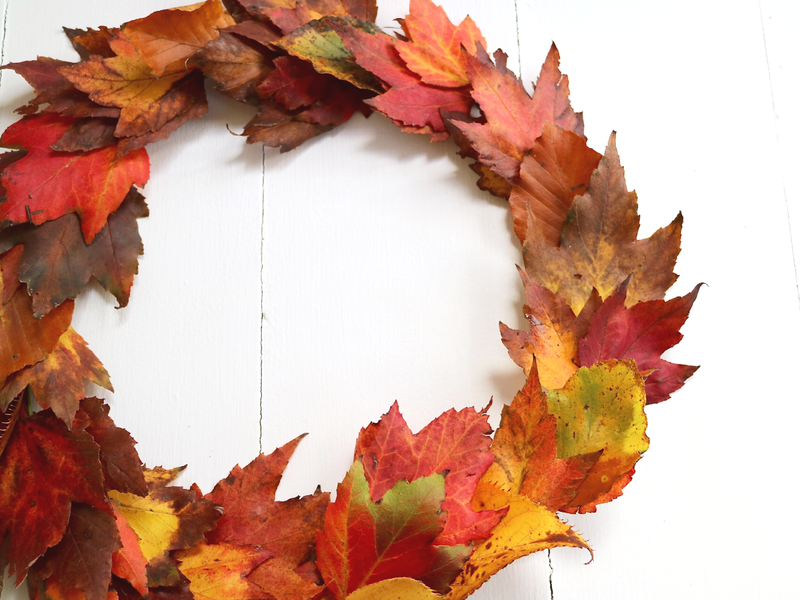 Once you've got a good base for your wreath, you can get started on gathering the leaves together. I found that leaves with long stems tended to be easier to work with, as I could wrap the wire and tape around them in a bunch without things getting too fiddly. All you need to do for this bit is select four or five leaves and arrange them together into a kind of mini leaf bouquet, making sure that their stems are long enough to be tied together. If you have any extra autumnal bits or bobs, like pinecones or acorns, you can tie them in to this bundle too! Once you've got a good bunch, wrap a section of floral tape around the stems and pinch everything together to get a tight bundle. 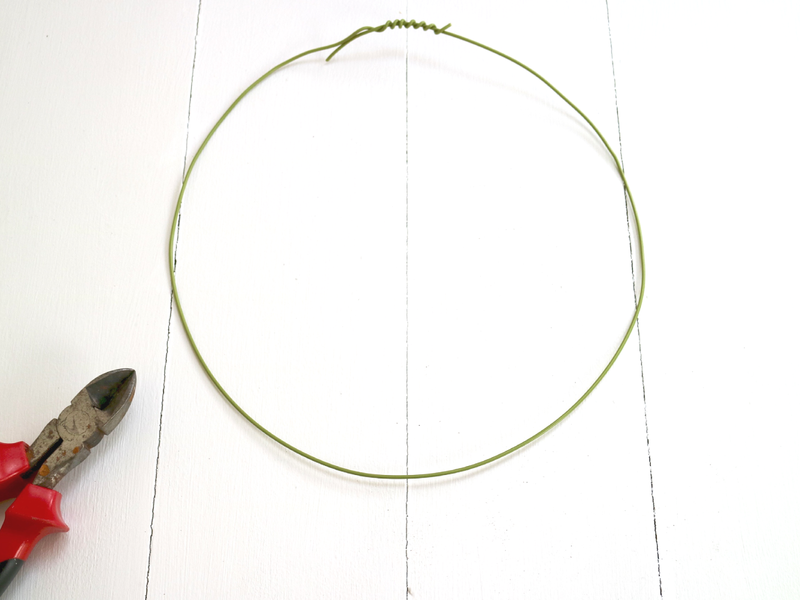 Then fix this bundle onto your wreath with a small length of wire or another bit of floral tape. I found that the further I got around the wreath, the easier and less fiddly it was to use the tape instead of the wire for this bit BUT if you have a thinner wire or a heavier bunch of leaves, it might be a better idea to continue using the wire all the way round. 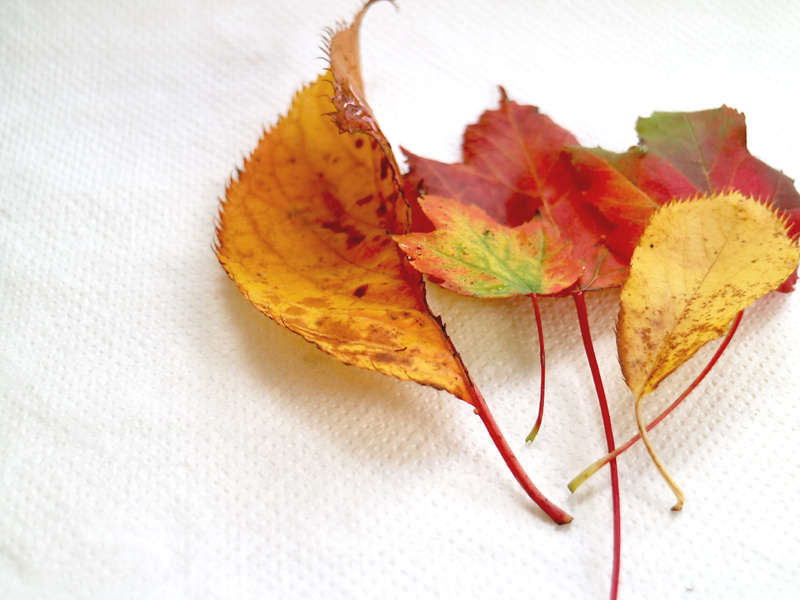 Keep on layering up your leaf bundles all the way round your wire base until you get something like this! Your leaves might need a little adjusting and 'filling out' to ensure they cover up the base and you can't see any bits of green wire poking through! As a final step, you could also twist a simple wire hook to the top of your wreath to make it easy to hang from a nail or door handle. 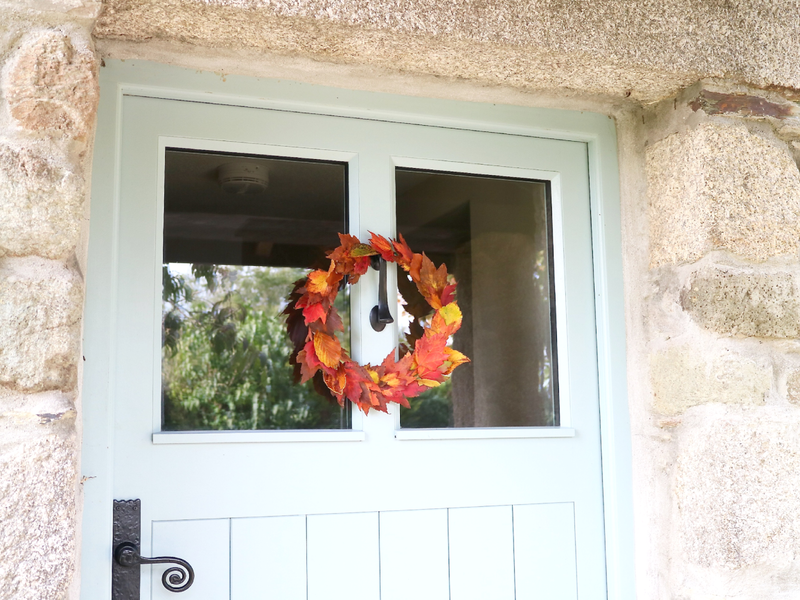 Here's my wreath sitting proudly on our front door. 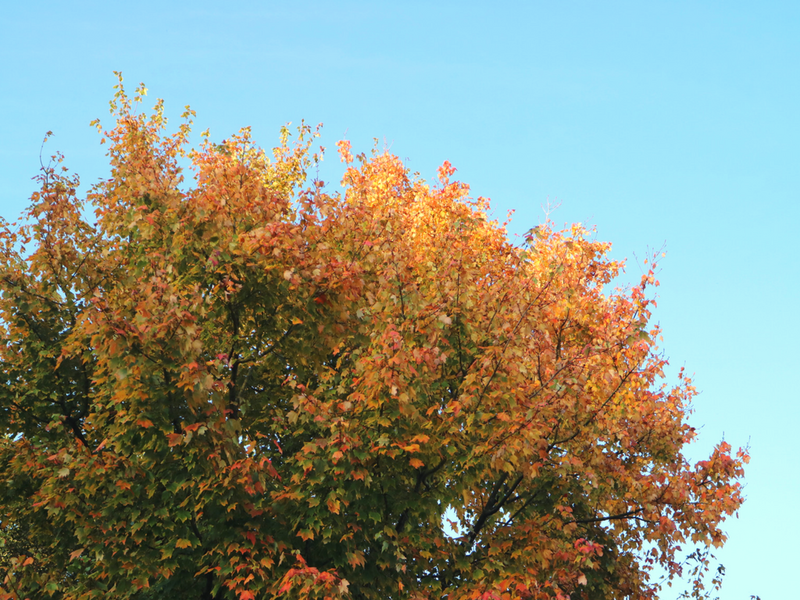 I love the way those bright, autumnal colours are contrasted against that pastel blue! A perfect, seasonal update! 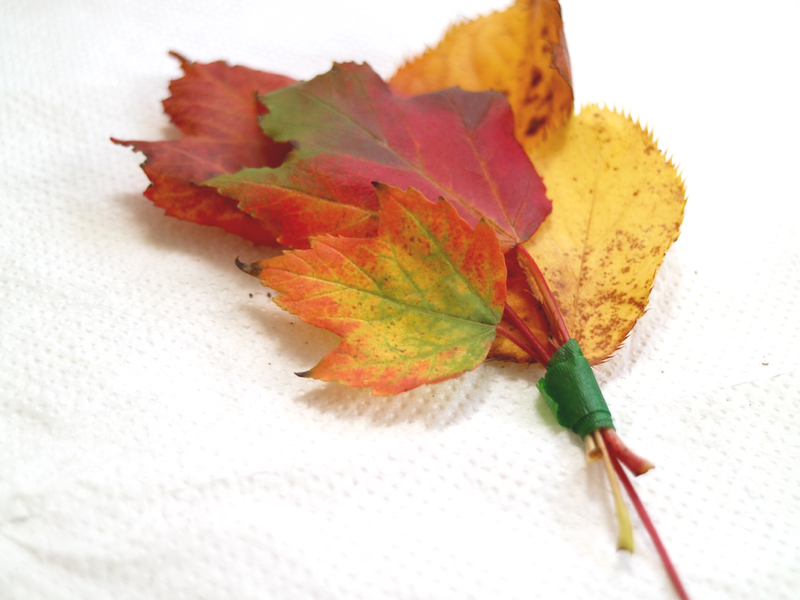 Do you have any leafy crafts you like to make at this time of year? I'd love to hear your ideas in the comments below. What better way is there to spend a sunny Autumnal morning than by picking a crop of your own baby pumpkins? Well, earlier this week, my Mum and I were lucky enough to spend a glorious Monday morning doing just that down at Trevaskis Farm in West Cornwall. I'd spotted a post on their blog that said, this year, the farm would open up their fields for the public to pick their own 'ready-to-carve' pumpkins just in time for Halloween... so of course, Mum and I had to give this a go! 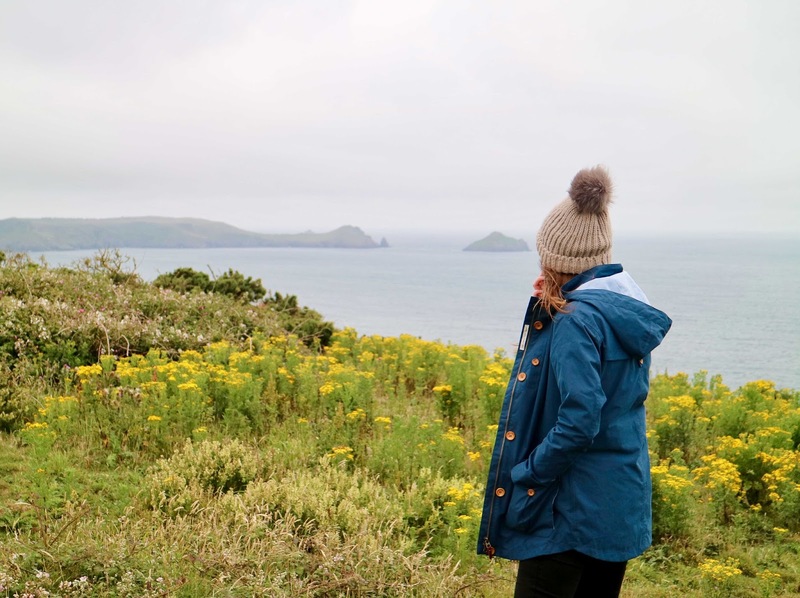 We bundled ourselves up in jumpers and woolly hats (sunny as it was, there was still a chill in the air...this is Cornwall after all!) and made the journey down to Hayle, thinking of all the best pumpkin recipes as we went. Unfortunately, however, the previous day had been the farm's annual 'Apple Day' festival and we were told by an assistant at the on-site market that the pumpkin field might have been left a little trampled by some overkeen festival-goers. Oh dear. I was, unsurprisingly, a bit miffed by this, but we walked round (passing some seriously cute goats on our way) to the field anyway in the hope of salvaging some pumpkins to take home and make some yummy soup with! The field looked empty when we came to it and, at first, it seemed as if all the remaining pumpkins had been well and truly squashed underfoot. 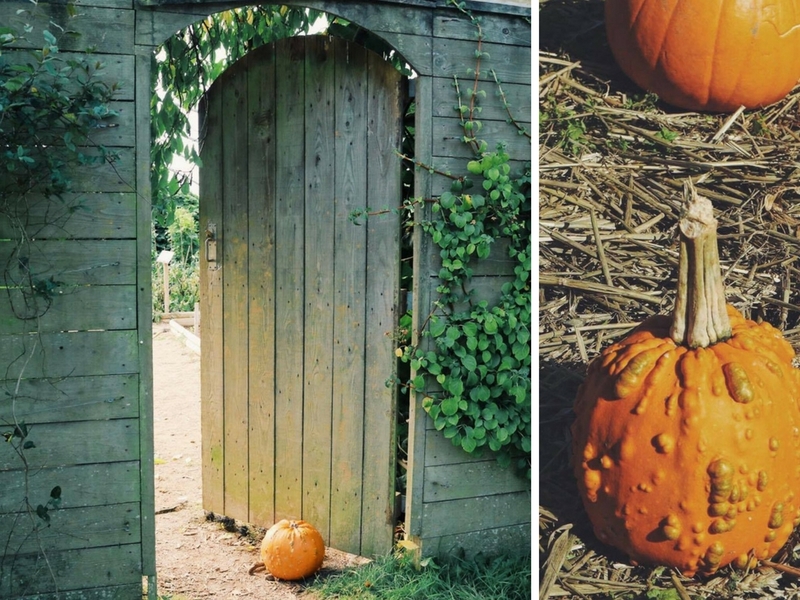 Cue a minor, blogger hissy fit on my part as I wondered how on earth I was going to write the post I had planned all about picking pumpkins... without the bloody pumpkins! My mum, however, saved the day when she came across a small and unusual-looking yet, most importantly, unharmed crop of baby pumpkins and squash that we could pick to our heart's content. We chose a small onion squash, a Blue Hubbard pumpkin/squash and a small type of stripy acorn squash. 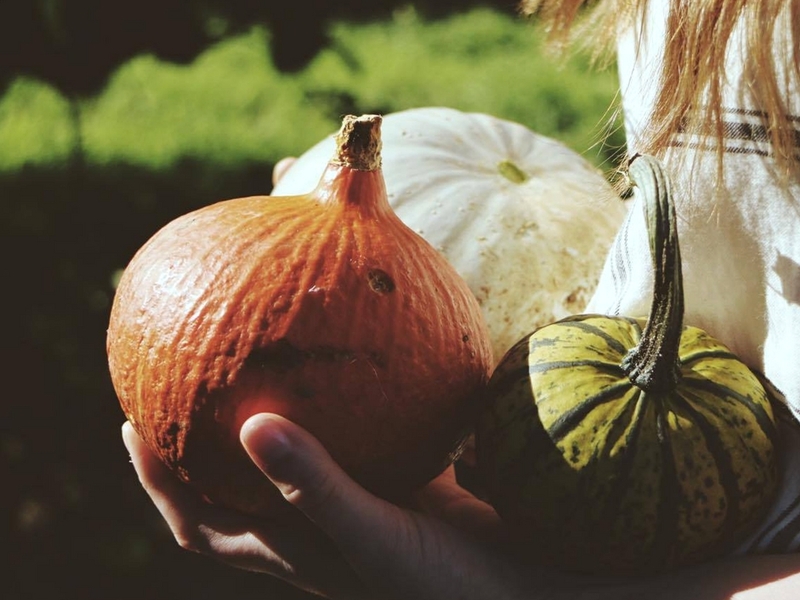 I can only assume that these varieties were left untouched because they didn't seem as pretty or as traditional as the classic orange pumpkins, but I definitely feel a certain amount of affection towards the funny little crop we stumbled across! Anyway, without the super-duper massive pumpkins I'd been hoping to pick, I'm afraid I haven't been able to rustle up any seasonal recipes or DIYs to share with you all. 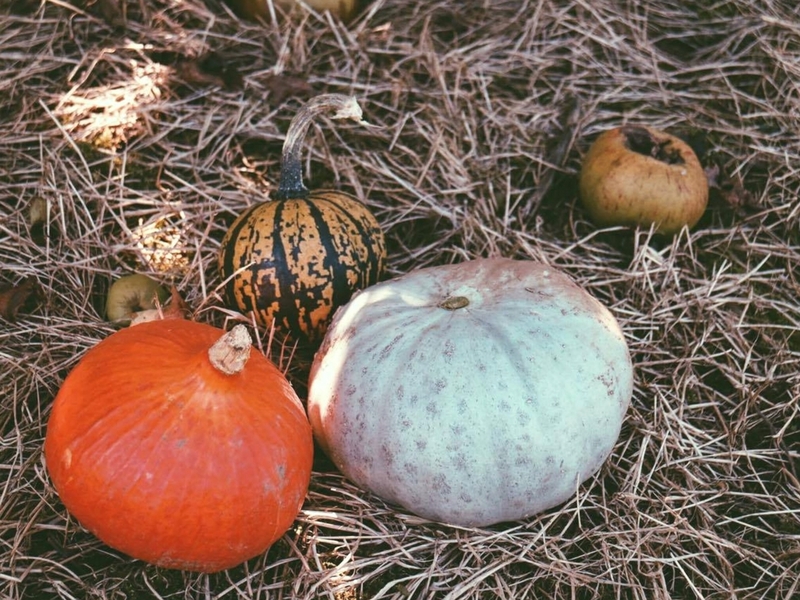 I do have some plans to decorate my lovely squashes in time for Halloween but, just in case I don't manage to post about this, I thought I would share some of my favourite Pumpkin Pinterest finds instead. 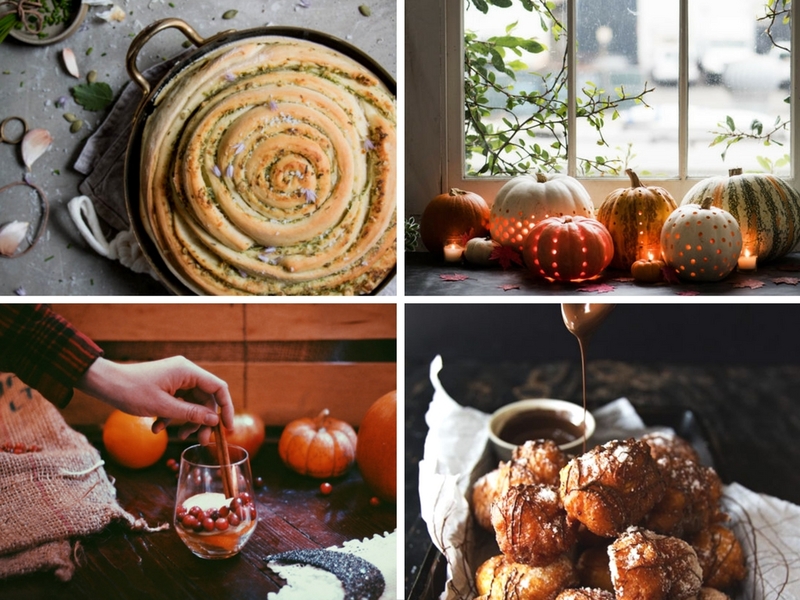 This gorgeous Chive and Pumpkin Seed Pesto Swirl Loaf / A stunning Pumpkin Lantern DIY / A potent Pumpkin, Cinnamon & Apple Spiced Sangria potion / + these decadent Pumpkin Doughnut Bites with a Dark Chocolate Drizzle. All in all, I can't deny that I was quite disappointed with our trip to Trevaskis Farm. Perhaps I should have called ahead to check if they had any pumpkins left to pick (will definitely do this in the future!) but I can't help but feel that, as they advertised it as such a fun day out, they should have made more of it as an event throughout October... not just something that ended on the first weekend of the month. However, we were definitely happy with our little squash pickings and we did have a lovely sunny morning walking around the farm. So maybe it wasn't such a disaster after all! 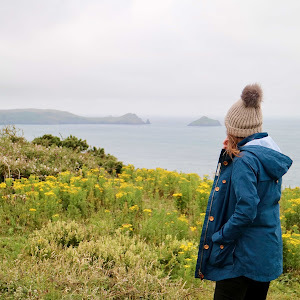 I'll certainly be posting more October and Autumnal themed posts throughout the rest of the month, so be sure to keep up to date with me on Bloglovin so you don't miss out. 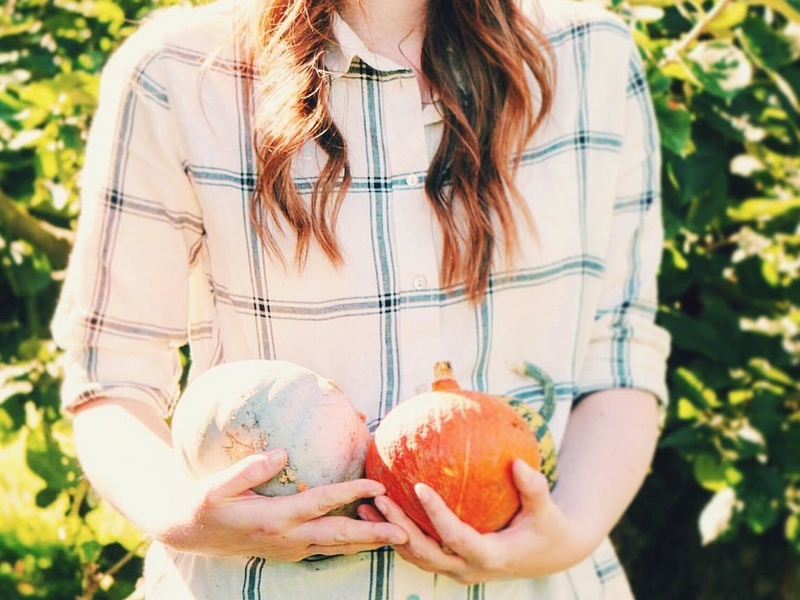 Do you have any pumpkin picking stories or recipes? I'd love to hear all about them in the comments below!